Pancreatic neuroendocrine tumors (PNETs) constitute only about 3% to 5% of all pancreatic cancers. Compared to the most common pancreatic cancer—adenocarcinoma (aka exocrine tumors), PNETs have a longer disease course and better prognosis; the 5-year survival rate is 42% for PNETs, but only about 5% to 6% for adenocarcinomas. When PNETs are localized, they can usually be removed by surgery. However, PNETs tend to metastasize, most often to the liver, and present a formidable treatment challenge at this stage. 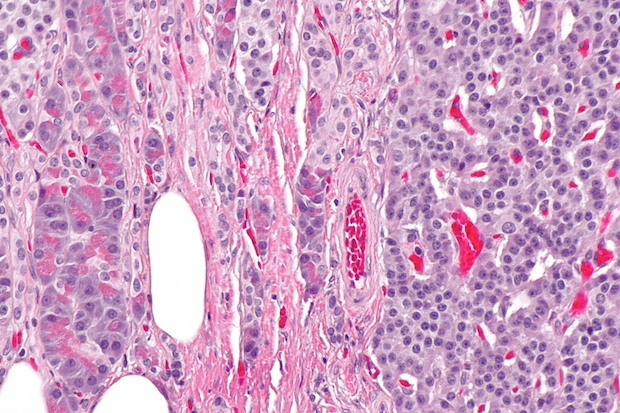 Most PNETs are sporadic, but sometimes they develop as a manifestation of multiple endocrine neoplasia type-1 (MEN-1), an inherited syndrome. As with other NETs, PNETs can be ‘functional,’ that is, they can produce excessive amounts of hormonal substances. The different functional types of PNET are classified by the type of hormones they produce, which is determined by the type of cells in the pancreas that gave rise to the tumor. At least five different types are recognized: gastrinoma, insulinoma, glucagonoma, somatostatinoma, and VIPoma— each named after the hormone that may be produced by it. Some PNETs produce more than one hormone. Only insulinomas tend to be limited to the pancreas, whereas the other subtypes are often found to have spread outside the pancreas at the time of diagnosis. Many PNETs do not produce enough hormonal substances to cause symptoms. Instead, the first symptoms actually develop as a result of metastases. However, in the case of excessive hormone production by functional PNETs, symptoms include abdominal and stomach pain, diarrhea, fatigue, and unexplained weight loss or gain. Unfortunately, these symptoms are often too unspecific to trigger specific tests or imaging that could help diagnose PNET. A smaller proportion of PNETs (~15%) are altogether nonfunctional, meaning that they do not produce hormones, which can also contribute to delays in diagnosis. The World Health Organization (WHO) classifies NETs based on their degree of differentiation—how different the tumors look from their tissues of origin. This ‘tumor grade’ (G1, G2, G3) also reflects how fast the tumors grow. Treatment of PNETs often takes into account the tumor grade. Surgery is the most common treatment for localized PNETs, and is the only treatment for PNET that is given with the goal of curing the cancer (as opposed to merely alleviating symptoms). Surgery can be performed for both less advanced and metastatic PNETs. The latter is unusual—surgery is generally not used for other metastatic cancers. But primary tumors are frequently removed even in metastatic PNET to alleviate symptoms. Metastatic PNETs often spread to the liver, and surgical excision of the affected liver lobe can be done to preserve liver function even if there are also metastases in other organs. Hormone therapy with drugs known as somatostatin analogues (SSAs) is used, when appropriate, to relieve symptoms by blocking the activity of hormones produced by tumors. Moreover, treatment of well- or moderately differentiated PNETs (G1 or G2) with SSAs has been shown in clinical trials to control tumor growth and prolong progression-free survival. The U.S. Food and Drug Administration (FDA) has approved the SSAs octreotide and lanreotide LAR. More recently, a radioactively labeled SSA entered clinical trials, with some success reported. At this time, ‘biological therapies‘ for PNETs are limited to the drugs sunitinib and everolimus, both FDA-approved for treatment of advanced PNETs based on the results of phase III clinical trials. These are, in essence, targeted drugs, but their use in PNET is not based on the presence of relevant tumor mutations. Sunitinib may target blood supply to tumors by inhibiting certain receptors involved in the growth of blood vessels. Everolimus targets the activity of a cellular pathway known as PI3K/AKT/mTOR that may or may not be involved in the development of PNETs. Knowledge of the molecular genetics of PNETs is very limited, as no comprehensive sequencing study has been performed with this tumor type. The optimal use of sunitinib, everolimus, and combination therapies that include these drugs remains to be explored. Treating PNETs with a combination of chemotherapy drugs usually has a palliative goal; that is, it may prolong survival, but does not usually cure PNETs. Chemotherapy is recommended for control of bulky or rapidly progressing disease. Streptozocin is a chemotherapy drug that is FDA-approved for PNETs, but it is associated with high toxicity. In small trials, the combination of temozolomide and capecitabine has shown the most promising antitumor activity in advanced PNETs, and it is currently being evaluated in larger trials. If a patient has liver metastases, a procedure known as hepatic arterial occlusion or embolization is used to deliver chemotherapy drugs or other agents to the parts of the liver where metastases are located. As with all NETs, the dearth of PNETs makes it difficult to conduct larger clinical trials. The absence of comprehensive genomic data for NETs precludes meaningful use of targeted drugs, and immunotherapy drugs have not yet made inroads into trials for NETs. Perhaps surprisingly, the death of Steve Jobs 7 years after he was diagnosed with PNET did not trigger an increase in efforts to better understand and treat this rare cancer.